Kestrel sometimes worries for Brightwood's quiet cub. The sun had set from a sky of perfect blue and a golden springtime's evening settled onto the Holt. While the last of the day's heat made some of the older elves languid, slow to start on their tasks, the cubs wasted absolutely no time in getting into mischief. For Rill, Cinder and Glow, the warm evening was merely good reason to strip out of their leathers, ride down to the river in a small howling horde and ride back up to the Dentrees holding bladders filled to burst with water. They tied the nozzles tight and ran around playing squirt-tag, dousing each other with water along with any other elf or wolf who happened to pass too close. Soon enough they had roped Crackle, Newt and even Notch and Chicory into the game, and had claimed the immediate surroundings of the Dentrees as a zone to enter at one's own peril. Only one small figure sat aside. Copper had played with her agemates for a time, but the racket soon became too much for her. She spent a brief while more sitting at the mouth of her family den, doing her share by squirting anyone who passed below while keeping well out of range herself. But this too wore thin, and she had turned her back on the game and crept into the den itself. The sounds of her guitar, idly strummed, wafted out into the balmy air. �Sometimes... I worry,� Kestrel confided to Brightwood. The two of them sat high on a firm branch of the Mother Tree, watching over the game and protected by Kestrel's nursing of little Flicker. Even the wildest of the youths below wouldn't dream of squirting the infant. Brightwood took advantage of that to half chat with the elder, half watch the mayhem below with serene amusement. �About what?� she asked, half-distracted. Kestrel waved a hand to pacify her. �I didn't say it was wrong. She's a healthy and clever kitling. And it's a relief sometimes, to be honest, to have one among the pack who isn't all trouble bundled with noise.� She chuckled as, far below them, Otter announced his joining the game by riding into its midst on a sopping wet Splash, who stood and shook his fur so mightily as to drench any elf within three wolf-lengths of him. Brightwood narrowed her eyes, but had to admit that the floater's words had given her pause. Copper did take after her father. She was not yet born to witness Kestrel's early years, but were Farscout's cub days so difficult? It was hard for her to remember, having been a cub herself, and younger than him. Her father's words floated back to her, though, Lynx's warning to be careful with Briar, that he could be hurt � when it was so hard to imagine that Ice's stoic, wise son could be hurt. It was a memory she cherished, and held close to her heart and mind, but now it made her lips draw thinly closed. She found herself glancing around for her daughter. A pulse of sending-thought came from the den below, a casual brush mingled with the delighted focus of music-making. Brightwood almost felt foolish for worrying. She watched as Copper came scampering out of the den, climbing down towards them, almost daring the watery chaos below to touch her. Kestrel was watching as well, she saw, still with a slight frown. Kestrel didn't answer. 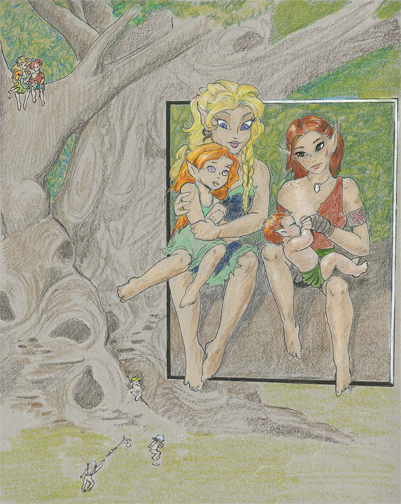 She simply watched as Copper planted her feet down beside them, and then wordlessly, happily, sat herself in her mother's lap. Brightwood put her arms around her daughter on driving instinct, glad for once that the girl didn't attempt to squirm loose. Kestrel's frown changed into a soft smile. She caught Brightwood's eye and, suddenly, shared with her a flash of a sent image. It was Lynx, sitting in much the same spot as they did now, at the mouth of a den very high in the Dentrees. He too had a cub in his lap � little Briar, younger than Copper was now, but also a sober little thing. This scene had taken place before her own birth, Brightwood realized, and fascination filled her at this glimpse of her father and her lifemate together. Briar wasn't struggling loose of Lynx's arms, and Lynx didn't seem to have said anything in particular. They were simply sitting together. Her future lifemate was calm and at ease, even as, Brightwood realized, the sent image was accompanied by the memory of sound, a rampant celebration among the trees where Kestrel herself, as she caught glimpse of the two overhead, had sat on the edge of the circle and smiled at the sight. Brightwood grinned in return. She thought the same.